The indicator finds all trends and builds the ranges along which it moves. Test the indicator for a month absolutely free. the wave rollback is recorded when the time interval between the current price and the point when the price was at this place on the current wave is exceeded. These rules allow you to objectively monitor the development of trends. I don't use moving averages and any change is always visible instantly without delay. the most common range width value from the previous history. The range starts being built in real time, and does not change its slope and width. Most of the time the ranges accurately describe the price movement. Cases when the price sharply goes beyond the range show non-standard behavior of the price. This does not happen often. Thus, the trend range predicts price movements. Now I want to say a few words about making money without hassle. This is certainly a pleasant desire, but unattainable. Ideas of indicators with up and down arrows will work with a probability fifty-fifty. The world is complex and there are no simple solutions. Do not trust the author's algorithms with an unclear principle of action. Explore the market yourself. You can look for patterns in the price movement with the help of my programs, which are built on open and clear rules and provide accurate information in numbers. In indicators, I often use a comparison of extremes, because on new extremes the price is under strong pressure, and inside the channel is much less. The nature of the price movement in these places is different. It is important. the minimum time interval to the point of the trend start, in days. The size of this parameter affects the length of the trend. By increasing this number, several small trends are merged into one. And the range of fluctuations in the trend also increases. the minimum time interval to the point of the wave rollback registration, in days. Increasing this parameter leads to a decrease in the number of waves in the trend. The optimal ratio is 2:1, 3:1. For example 10 days and 4 days. In the table of the indicator, almost always you can see two trends. The first is the registered current trend. The second below is a new emerging opposite trend. It is not noticeable yet, but you already know about it. However, not every new trend can develop into the current trend. 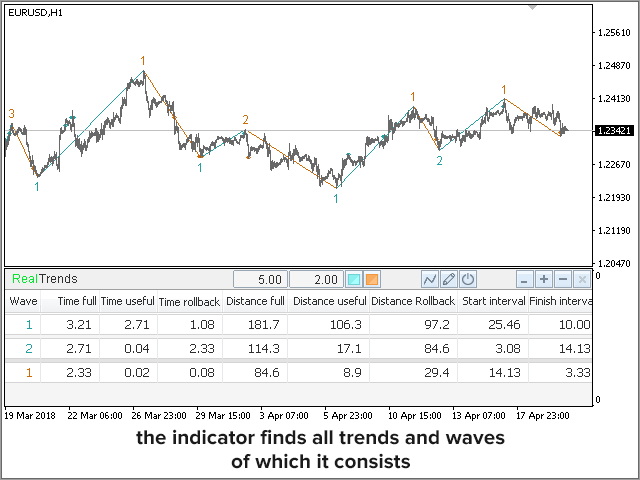 The numbers help to estimate the trend, size and duration of each wave in the trend. I created many convenient controls of the indicator. Download the free trial version and experiment with the input parameters. It is more convenient to watch built range on large time frames. Since the construction of the ranges depends on the historical data, it is necessary to wait for some time when the tester will correctly display it. The input and output parameters of this indicator are independent of the time frame. At any scale, all values will be the same, but may vary slightly due to the level of detail and depth of history. You can freely switch between time frames for a better overview of the chart. Thanks for attention. Good luck!